Sold out. You may inquire. An urgent and historical breakthrough book. ● Proof that Chemtrails are very real, and are not “contrails. And they are very harmful. ● Until this book, all sources about what Chemtrails contain and what the goal behind their use is, have been false. ● Chemtrails are not about “geo-engineering” or global warming. ● NOW finally revealed: Chemtrails’ contents and the actual agenda behind their use. ● Our first color illustrated book. ● Also contains the very first accurate reference on Morgellon’s Disease. You will find out whether this skin problem is real, and what the cause is. ● The ultimate truth about Chemtrails is a “must read” book for every adult human being. Limited edition printing. Collector's item. Large sized book. 8.5" X 11" 13 color Photos/illustrations, 2 B&w. 50 pages. Perfect bound. © Prof. Steven Rochlitz January, 2017. All Rights Reserved. Price: $28.00. Shipping: USA, $5.00, to Canada: $7. TO Overseas: $10. ISBN: 978-0-945262-67-4 All sales final once the book has shipped. 1. An analysis of the crime, and what probably happened. 2. What hidden illnesses—about six—the evidence and previous incidents indicate that Oscar may have and/or inherited. Cover Photo: Erik van Leeuwen/Wikipedia. You see that instead of being a neo-modern Superman, as the media has proclaimed, Oscar Pistorius seems to have some of the same modern problems and environmental sensitivities that you and I are afflicted with. This is a great book to read, and then give to a friend or family member as it contains many of my breakthroughs in health in the simplest form ever. Did Oscar Pistorius previously display rage, jealousy, impulsivity (poor impulse control), schadenfreude? What hidden medical problems could have caused these seeming mental problems? What evidence is there for these hidden, medical problems? The author felt the need to try to prevent others from repeating the tragedy Reeva went through. Price $20.00 plus shipping. Shipping fees: To USA, $4.00, $12.00 to overseas. Supply is limited. First click the arrow for the correct shipping destination and TOTAL--book plus shipping option. It is necessary to tell the world what really happened with this novel…approach to the truth of the murder, and of all the corruption and collusion involving the police, both defense and prosecution, the judge, and the worldwide media disappearance of some crucial trial facts. This riveting account will have you gripped to your seat. ● Was another gun fired at the victim 17 minutes before the schadenfreude murder? This riveting book--with many secrets revealed-- serves as a window into the deepest nature of the real world. Limited edition printing. Collector's item. Contact us first to check for availability. Please select the shipping destination below—click the little arrow. Contact us about this book. 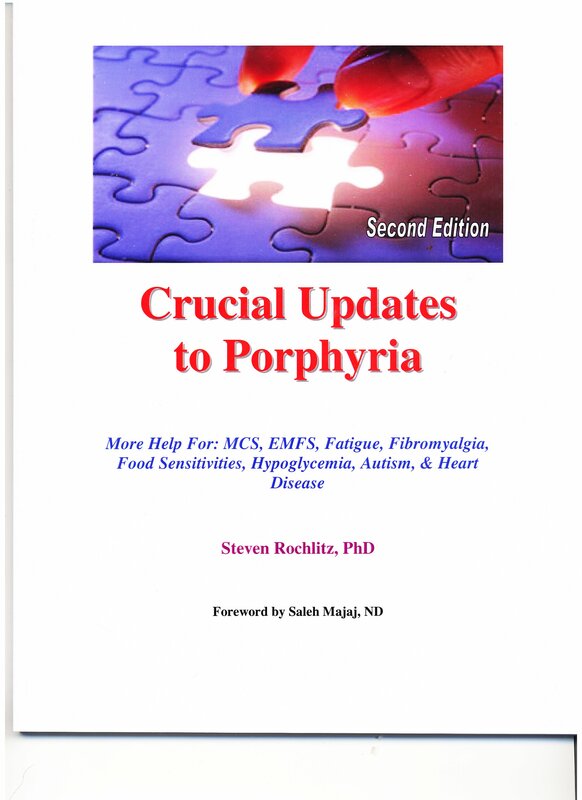 CRUCIAL UPDATES TO PORPHYRIA, 4th Ed. A new book with different information, not in the main PORPHYRIA: The Ultimate Cause book, which has 192 pages, large size. Again, this is a completely different book with 126 pages. Sold only to those who have bought the first, main Porphyria: The Ultimate Cause... book from us. Topics include: how (usually hidden) porphyria weakens the immune system, and why supplements do not overcome this; new supplements for heart health, stomach or bladder distress; what holds people back from wellness; which foods are proven to cause mast cell disease, new protocol for heart failure, and much more. .If you have the book,. Porphyria: The Ultimate Cause of Common, Chronic or Environmental Illnesses. With Breakthroughs in Diet, Supplements and Energy Balancing, you need this updates to it. NOW with the "HOLY GRAIL":Proof that British Physicians declared that "Porphyria is NOT a rare disease." The latest printing now has the historic proclamation, and evidence, from Prof. Rochlitz, that "Porphyria and Mast Cell Disease are COMMON disorders." Incudes Rochlitz' greatest cases: An Autism Cure, MCS cure, bringing back a flatliner, and more on the intersection of pyroluria and lyme's with the key: Porphyria. Foreword by Saleh Majej, ND. Price: $25.00 plus shipping--$7.00 to USA, $14.00 to Canada, $19.00 to Overseas. If you meet the above terms only, you may order. Please click on the arrow to elect destination. Copyright©2000-2016 S. Rochlitz. All rights reserved.